The surgeons at West Hills Animal Hospital & Emergency Center provide the highest quality surgical and specialty surgical care, recovery, and pain management available for your pet. You can count on all of us at West Hills Animal Hospital & Emergency Center to provide comfort, compassion, and quality care throughout the entire surgical procedure. Prior to surgery, all patients are carefully screened. We perform pre-surgical blood work so we can evaluate your pet’s kidney, liver, and heart function prior to undergoing anesthesia. Anesthetics are specifically tailored for your pet. All surgical procedures include the latest monitoring equipment. 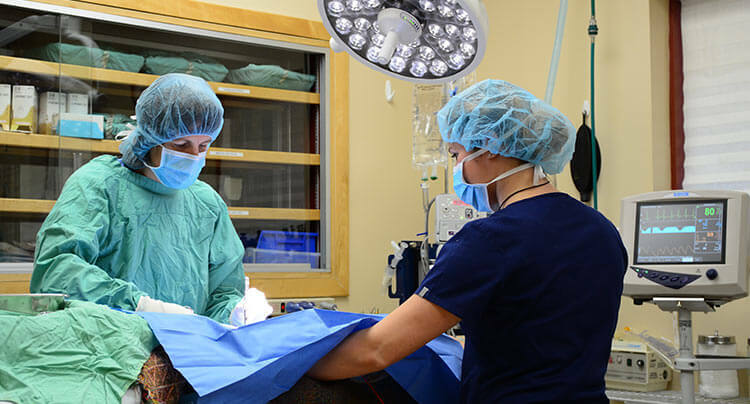 We utilize the most current and advanced sterilization techniques; our fully-trained veterinary and technical staff will monitor your pet before, during, and after their surgical procedure. We utilize the safest, multi-modal anesthesia techniques available and provide the same level of patient monitoring that you would receive if you were having surgery. We use multi-parameter monitoring during surgery to monitor your pet’s blood pressure, respiration, heart activity, ventilation, oxygen saturation and temperature. Your pet’s pain relief is our top priority. At West Hills Animal Hospital & Emergency Center, we ensure your pet is comfortable before surgery. We give your pet pain medication before, during and after surgery. We utilize multiple therapies to control pain so that your pet is as comfortable as possible until they are fully recovered. Once the procedure is completed, a member of our staff will call you with a status report. When you pick up your pet, the doctor or nurse will review the procedure with you and send you home with easy to understand aftercare instructions. We will call you within a few days to check on your pet and answer any additional questions.